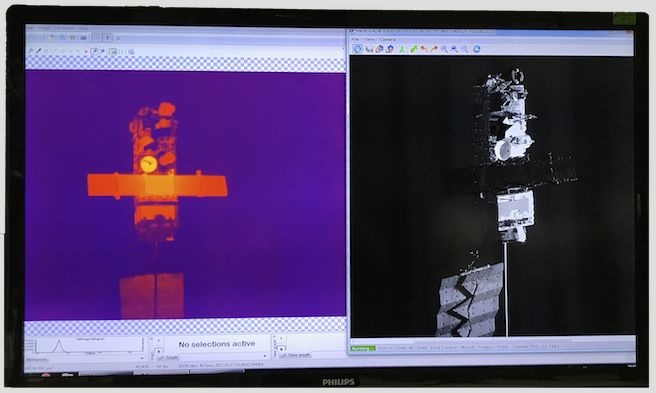 Thermal infrared and visible light cameras mounted on a robot arm as it approaches a model of a dead satellite, as part of a demonstration of vision-based navigation systems intended for ESA's e.Deorbit active space debris removal mission. ESA's Orbital Robotics Laboratory carried out the demonstration, to investigate the kind of guidance, navigation and control systems the mission will need to close in safely on a drifting satellite, as a prelude to capturing and deorbiting it. In the orbital environment, light conditions are changing all the time, with rapid sunrises and sunsets alternating between complete darkness and dazzling sunlight, so thermal infrared offers a reliable backup imaging solution. ESA's Clean Space initiative is developing the e.Deorbit mission for a projected launch in 2024, intended to take down a large item of ESA-owned debris. Clean Space is working with a variety of expert ESA teams to develop the high-performance technologies such an ambitious mission will require.